Why not throw aside the formality of a traditional Christmas party and instead, host a Holiday Oyster Roast? I assure you, this is one of the very easiest parties to host. First and foremost, casual and warm clothes are a necessity as you are outside beside a smoking grill. 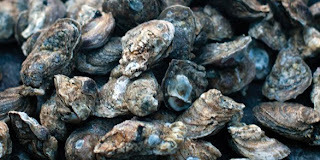 Grab a couple bushels of oysters and 10-12 of your buddies. This is an easy party to accommodate a crowd as the rule of thumb is one bushel per 6-8 guests (depending on appetites). Be sure to clean the oysters properly, remember that these little guys have been living in a mud bed. Get the grill going, if you have oak, put it on the fire once you get it going as it produces heat with less smoke. Place the oysters on the grill rack and be certain to space them out so they are just barely touching. 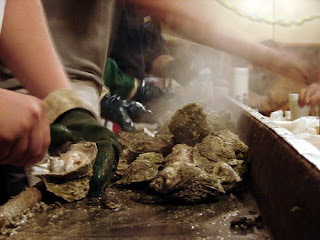 Occasionally, as the oysters are cooking bits of shell will fly out so it is important to be alert while at the grill. When the mouths of the oysters start to open, they are ready to be eaten. Once the oysters are finished, be sure to exercise caution when getting them off the grill as they are quite hot. Lift the rack off, holding it with heavy folds of paper, or cloth, and empty the oysters onto a table. Use some heavy cotton gloves, or pieces of paper to hold the oysters while you finish opening them. An old paring knife with a heavy blade or an oyster knife works well ( I like to use red checked cloth napkins to hold the oysters- a festive touch). When I throw an Oyster Roast, we use a makeshift table that my husband made. It works quite well as it is a piece of plywood with a hole cut in the middle. We place a trashcan under the hole and guest just toss their shells in the hole. Easy clean up! I set numerous little bowls with cocktail sauce, clarified butter, horseradish and Tabasco sauce. Also, be sure to have an abundance of saltines. Guest stand around the table, drinking cold beer ( I suggest Dixie and Abita) and shucking oysters. It is a grand time! This is a perfect month for hosting a roast as tradition as it that oysters are best when eaten in months ending with the letter "r". 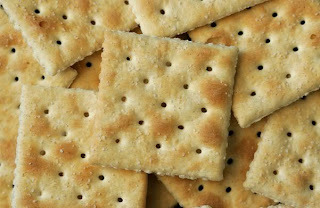 The idea is, if you are not familiar, shuck an oyster and place it on a saltine. Place a dab of horseradish and a bit of cocktail sauce on top of the oyster and enjoy! For decor- keep it simple by stringing up some bright holiday lights on your deck or around the grill area. Your guest are sure to love this casual holiday party and you will too. The best part is perhaps that clean-up is so minimal- just empty the trash! *Images from butlerbureau.com,Drayton Hall, gilbertology.net,lemarkbbc.com. This entry was posted on 2:19 PM and is filed under Oyster Roast . You can follow any responses to this entry through the RSS 2.0 feed. You can leave a response, or trackback from your own site. This sounds like so much fun! If we could get a hold of some fresh oysters, it would make for the perfect get-together. And, yes, Dixie Beer is a must! Hi JMW! A tip for those who don't live on the coast- check out the fish counter at your local Whole Foods. Stores such as this often ship in fresh seafood daily and can be a great resource. 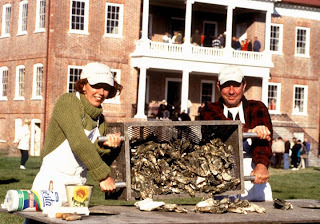 Also, many online retailers will overnight fresh oysters to your doorstep (see below). it would make for the perfect get-together. 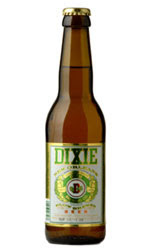 And, yes, Dixie Beer is a must!